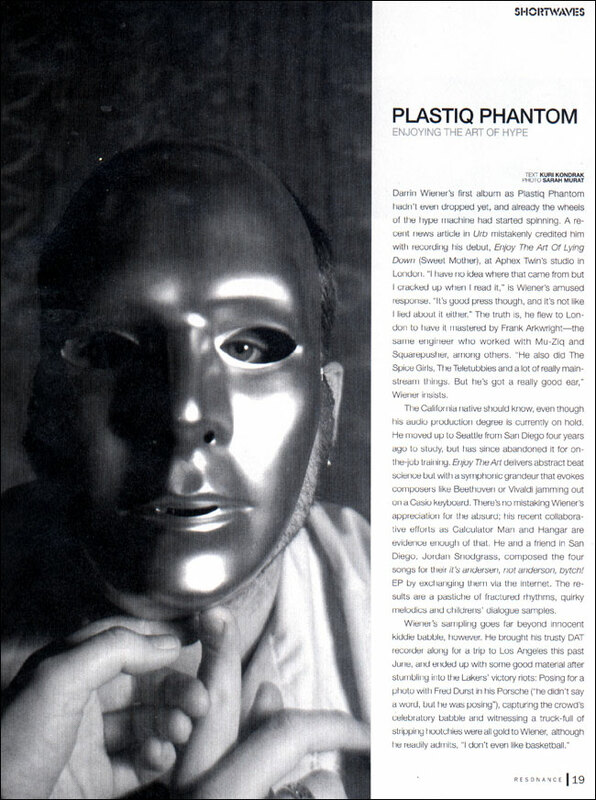 Darrin Wiener's first album as Plastiq Phantom hadn't even dropped yet, and already the wheels of the hype machine had started spinning. A recent news article in Urb mistakenly credited him with recording his debut, Enjoy The Art of Lying Down, at Aphex Twin's studio in London. "I have no idea where that came from but I cracked up when I read it," is Wiener's amused response. "It's good press though and it's not like I lied about it either." The truth is he flew to London to have it mastered by Frank Arkwright - the same engineer who worked with Mu-Ziq and Squarepusher, among others. "He also did The Spice Girls, The Teletubbies, and a lot of mainstream things. But he's got a really good ear," Wiener insists. The California native should know, even though his audio production degree is currently on hold. He moved up to Seattle from San Diego four years ago to study, but has since abandoned it for on-the-job training. Enjoy The Art delivers abstract beat science but with a sumphonic grandeur that evokes composers like Beethoven or Vivaldi jamming out on a Casio keyboard. There is no mistaking Wiener's appreciation for the absurd: his recent collaborative efforts as Calculator Man and Hangar are evidence enough of that. He and a friend in San Diego, Jordan Snodgrass, composed the four songs for their It's Andersen, Not Anderson, Bytch! EP by exchanging them via the internet. The results are a pastiche of fractured rhythms, quirky melodies, and childrens' dialogue samples. Wiener's sampling goes far beyond inncocent kiddie babble, however. He brought his trusty DAT recorder along for a trip to Los Angeles this past June, and ended up with some good material after stumbling into the Lakers' victory riots: Posing for a photo with Fred Durst in his Porsche ("he didn't say a word, but he was posing"), capturing the crowd's celebratory babble and witnessing a truck-full of stripping hoochies were all gold to Wiener, although he readily admits, "I don't even like basketball."